Amaretti Virginia, Award Winning "Soft" Almond Cookies...sweet memories of the past! Made of soft textured, fragrant, almond paste, Italian Amaretti soft cookies are still prepared to this day with as much passion & professional care as did the Master bakers of past eras. 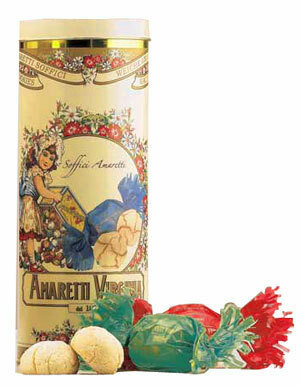 Amaretti soft cookies... made since 1860, in Sasello, a small town in the heart of the Ligurian region of Italy. Enjoy these special Amaretti soft cookies with coffee or tea...serve with a fine dessert wine or after dinner liqueurs. Amaretti Virginia Soft Italian Almond Cookies (Gift Tin). Individually wrapped in colorful paper.